Incorporate the old self of childhood into your adult self of today. into your adult self of today. This card is about wholeness and integrity. It’s about consolidating the different parts of yourself into a single, unified being. It’s a call for you to get clear, solid, and complete. If you drew this card, it’s time to pull yourself together. If you have conflicting desires that play out in different areas of your life, get off the fence and pick a single stance. If you’ve been a chameleon changing yourself to fit in or please other people, now is the time to show YOUR true color. If you’ve been re-visiting the past—your childhood, teen years, former relationships, and work situations—it’s time to coalesce ALL of that experience into wholeness. It is okay to admit your mistakes. You no longer have to appear perfect to others. You can own it all! Your past choices and life experiences—for better or worse—are living parts of your whole self. IF this card appears upside-down, you’re having difficulty putting the pieces into a whole. Usually this problem is caused by “all-or-nothing” black and white thinking. Integration means we have to accept shades of grey. We have to replace the word “or” with “and.” We have to allow for contradiction and complexity, for some parts of ourselves to be one way and other parts to be another AT THE SAME TIME. 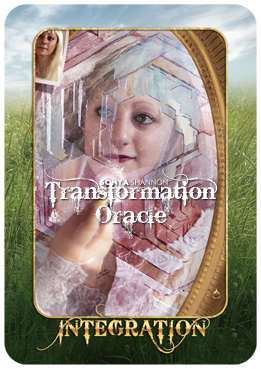 Check out the other cards in your spread or shuffle the deck and draw another card for insights about acceptance.